crunching sound of the leaves as you walk through them, and the fabulous smell of decaying leaves. 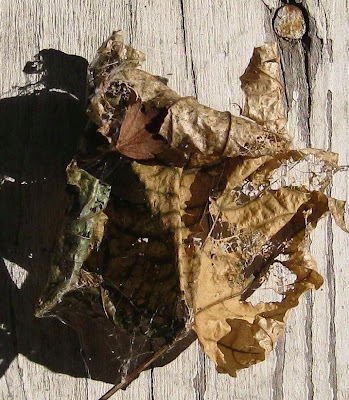 I saw this leaf today and was enchanted by the textures of the leaf, the wood, the cobwebs and the lacy membranes that are so tentatively holding onto some of the holes. I did get some pretty pics of red, yellow, orange leaves, but these are more interesting to me. Fall is the shutting down time before the long sleep. I love it all! Thanks for sharing your pix! I like the second and the third photo so much ... they are really wonderful. I love Mother Nature. I really enjoyed your pic's. I have loved Fall as early as I can remember. I enjoy gathering the interesting and decaying foliage. Yes...fall is my favorite season. Just gorgeous! The photo of the partial skeletonized leaf is beautiful. I could just see it incorporated into a fairy scene somehow. Thank you for sharing! Sweet Sue of the lovely daughters. If you can believe it the only laughing moment of the weekend was me having to clean Jacquie after she had diarrhea and we were both laughing because I was gagging and the mask kept slipping over my eye. I know gross, but it was funny. 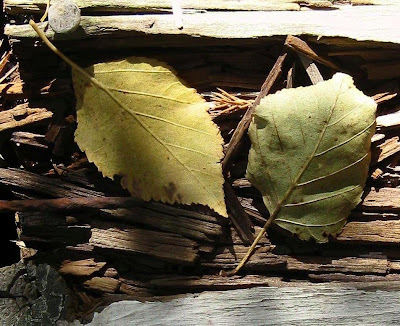 I love decaying leaves also Sue... You found a great example! Don't you wish you could keep it just the way it is... is there a way to preserve those kinds of things? I wonder. ...and I wonder too about the doll making? Yes! I do see the little woodland sprite! I can see her and she is wearing the textures of the decaying leaf.